Having a clean bathroom is a strangely satisfying feeling. It’s not just having the towels hung up and the sink wiped free of toothpaste globs, but when you can see that sparkle on your countertops and in the tub and toilet that comes from a deep and thorough scrub. If you feel the instant gratification from a shining bathroom as much as we do, read on for this easy guide for how to make your bathroom cleaner than ever before. If you have multiple bathrooms, tackling them one at a time is a good strategy because it keeps you focused on the room that you’re in. It’s also helpful to completely clear off your bathroom counter and your shower/bath shelves. Move all your toiletries to another room, so that you can keep your toothbrush away from chemical-based cleaning products. This also gives you a chance to throw away any empty bottles that are still in shower. Finally, take a look at your shower curtain liner—if it looks spotty, throw it in the washing machine on delicate to freshen it up and then hang it to dry. Now that your bathroom is empty, gather your supplies and turn on a podcast or your favorite music. It’s time to clean! Paper towels or several cleaning rags. It’s best to start with the toilet so the cleaner can soak in the bowl while you clean the outside. Apply the toilet bowl cleaner inside the rim of the toilet according to the instructions on the bottle. Let it sit to clean away any residue. Close the lid and get to work on the outside. Take a dry paper towel or rag, and wipe any dust and hair off the base of the toilet. Do the same on the top of the tank and the area between the lid and the toilet tank. Take another paper towel and spray it with the bathroom cleaner. Wipe down the outside of the toilet as many times as necessary. 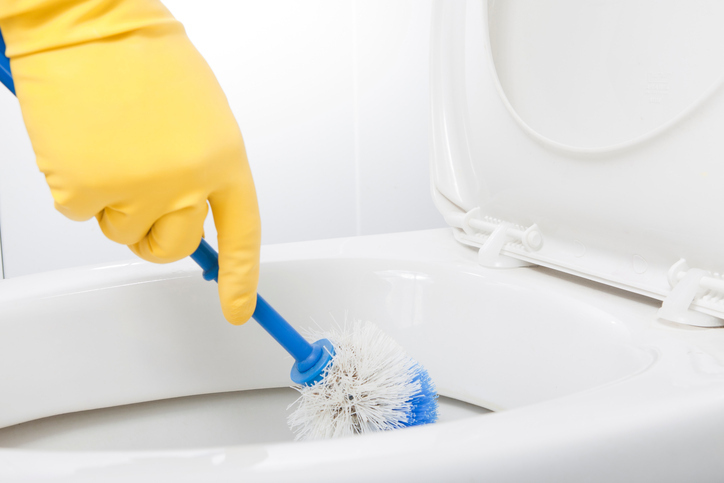 Using the toilet brush, scrub the inside of the toilet, under the seat and any place there may be stubborn residue. Flush the toilet and rinse the brush. One round of toilet bowl cleaner is usually enough, but if it’s an old toilet, you may have to do two rounds. Place the toilet brush in its holder and put it away. You’re done with this part! Take the dry rag or a paper towel and wipe the bathroom counter down. This cleans off any dust, makeup streaks, or stray hairs. Then spray the bathroom sink, the faucet, and the counter with your bathroom cleaner. Let it sit according to the directions. Wipe down the counter, taking your time over any stubborn spots. Rinse the rag and then wipe the counter once more. Repeat with the faucet and the sink. 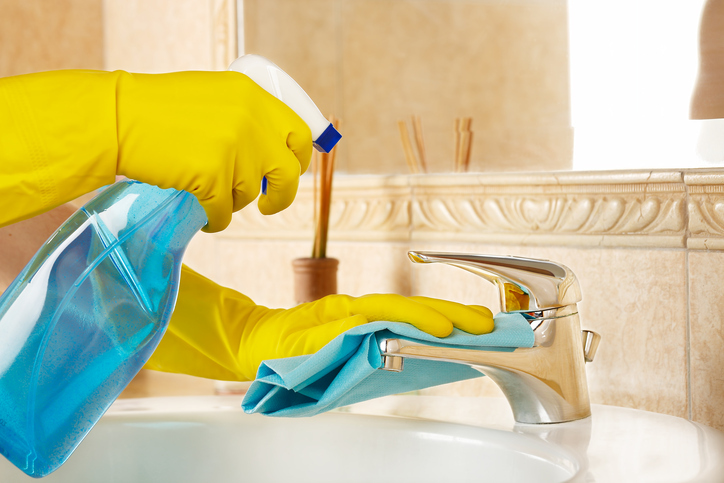 Pay attention to your sink stopper, as it may need to be sprayed again with the bathroom cleaner again. Note: If you think you have a clog, either snake your drain or use some Draino, then clean your sink. 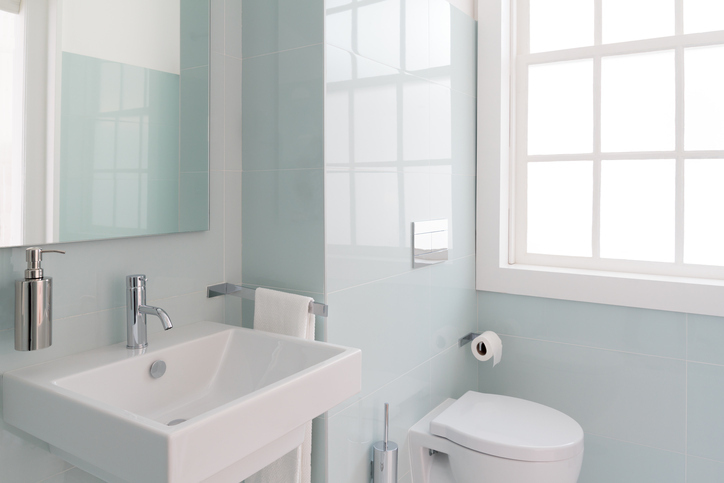 To clean your bathroom mirror, there are two options. One is to spray the glass cleaner on a rag and then wipe down the mirror. The second is to spray the cleaner directly onto the mirror and then wipe down. Then take that paper towel and go over the faucet and handles again to take care of any streaks the bathroom cleaner left behind. Start by spraying your shower walls with the mold and mildew cleaner, so it can work its magic while you scrub your tub. Pay attention to the corners of your shower and where the walls meet the bathtub. If you only have a shower—or if you have a shower with glass doors—let the shower cleaner sit while you enjoy a glass of water or take a quick break. Save the doors for the end, so they don’t get spotty again after you rinse your shower walls. To clean your bathtub, spray the sides and the bottom of the tub thoroughly with the bathroom cleaner, giving extra attention to any rings that may have formed. Let the cleaner sit according to the directions on the bottle. Now take your sponge and run it under the warm water. Using the scrubbing side, scrub any stains, rings, or caked-on soap until they’re gone. It may take several attempts using the bathroom cleaner and warm water. Rinse out the sponge and use the smooth side to wash your tub a final time, making sure all residue is gone. With your sponge, go back to your shower walls and rinse off the mold and mildew cleaner, spending time along the grout and in the corners. If your shower head is adjustable, spray it along the walls and follow with the sponge to ensure no residue remains. If you have shower doors, now is the time to clean them according to the directions. For a streak-free shine, do one pass with the shower cleaner and then follow it up with the glass cleaner. Finish by hanging up your shower curtain and liner, replacing your toothbrush and toiletries, and giving yourself a pat on the back. You’ve just successfully deep cleaned your bathroom!